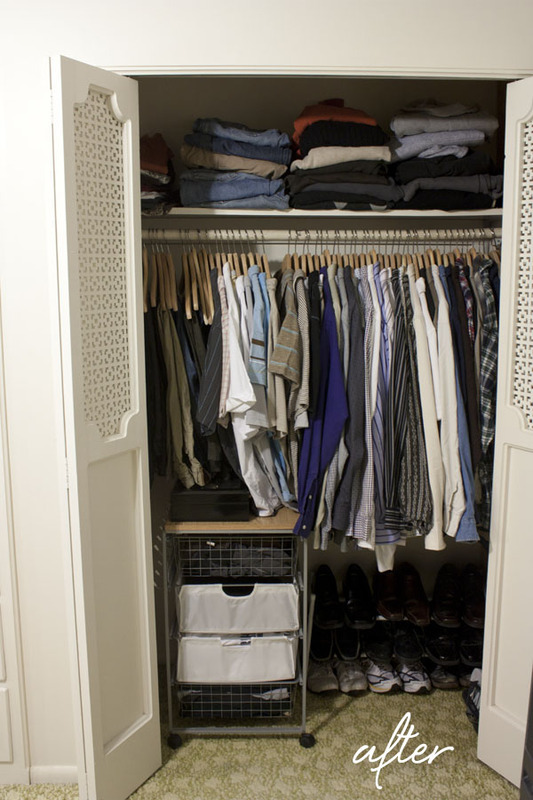 My closet itself wasn't terrible, but it was overfull and still contained a lot of summer clothes. When I was done it was so much better; much less crowded, and seasonally appropriate. One little trick to share with you: see my boot collection up on top? This Christmas I collected all my empty wrapping paper rolls, cut them in half, and stuffed them inside my tall boots to help them stand up and keep their shape. Something beefier would work better, but for now, this helps tremendously. I also cleaned out the drawers below it and even emptied an extra drawer for Tom to use. This project seemd like torture. 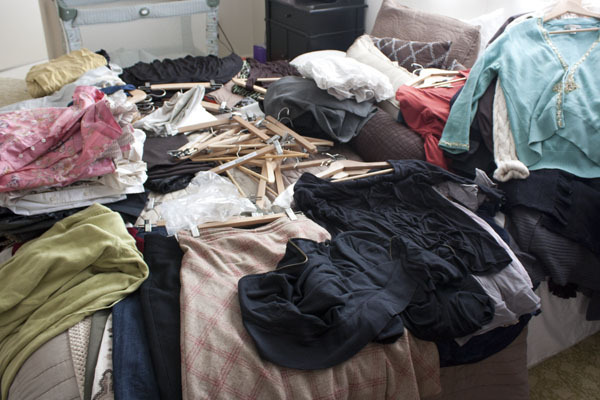 Not the work itself—that was relatively easy—but the getting rid of things. I have to admit I wasn't as strict as I wish I would have been on purging. When I acquired most of these clothes I had a professional desk job that paid me well, and I wanted to look the part. I spent good money on them, so it made it harder to part with them—even though heels, dress pants, and fancy work clothes no longer fit my lifestyle. I cut myself some slack and will get rid of more things over time. I completely cleared the closet first. See? Here it is looking completely bare. 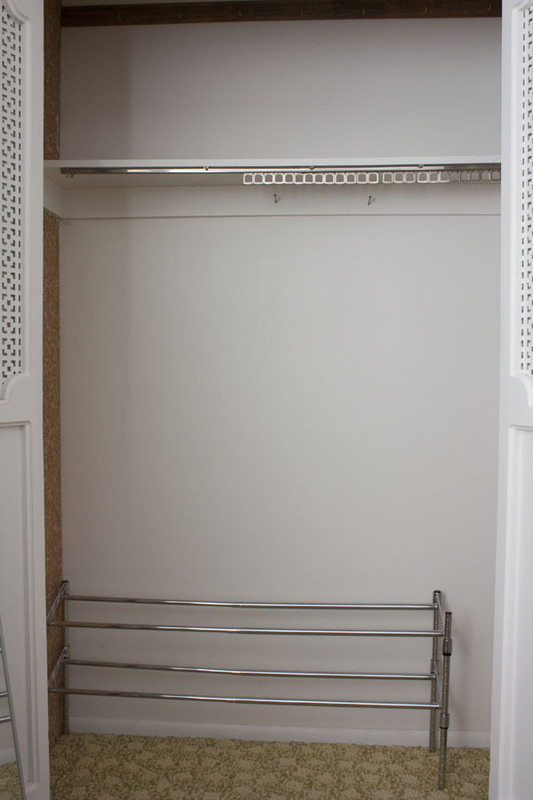 My intention was to replace those clip thingies with a traditional closet rod. But then I discovered the rods we bought were too long and would need to be cut down. So, the clips remain until my hubby has time to cut the bar and install it. The bin on the left is full of clothes that don't fit right now. I know you aren't supposed to do this, but I'm sorry—I paid good money for these and I intend to wear them again! My post-baby nursing-momma body can't wear them, but it isn't like I have to lose 50 pounds. 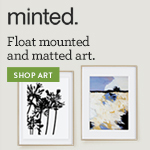 Its attainable, and so I will store them until I accomplish this goal. At least they aren't taking space in my closet and making me feel bad every day whe I look at them. 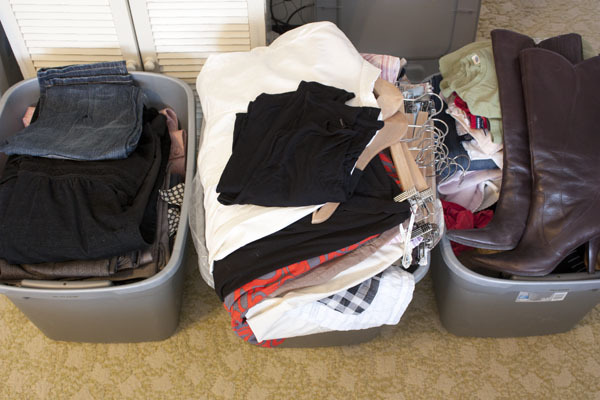 The second bin is summer clothes to store in another closet. I have them all on hangers so they can be swapped out easily in warmer weather. The bin on the right is clothes and shoes to donate. A good start! 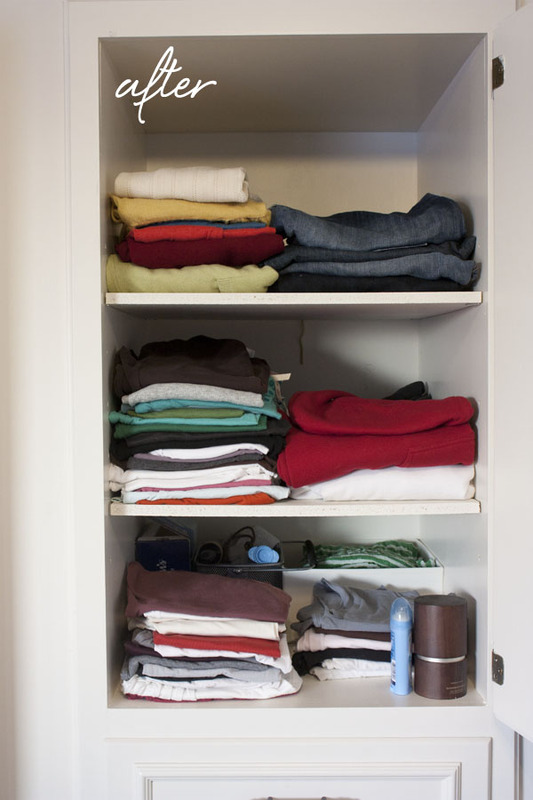 I didn't purge anything—I'll leave that up to him—but it is so much neater and hopefully will encourage him to put his clothes away instead of in piles in front of his closet. Yahoo! The author of 27 Things To Feng Shui Your Home says "Clearing clutter creates space for something new to come in, and what is new can be empowering". Shopping, anyone????? 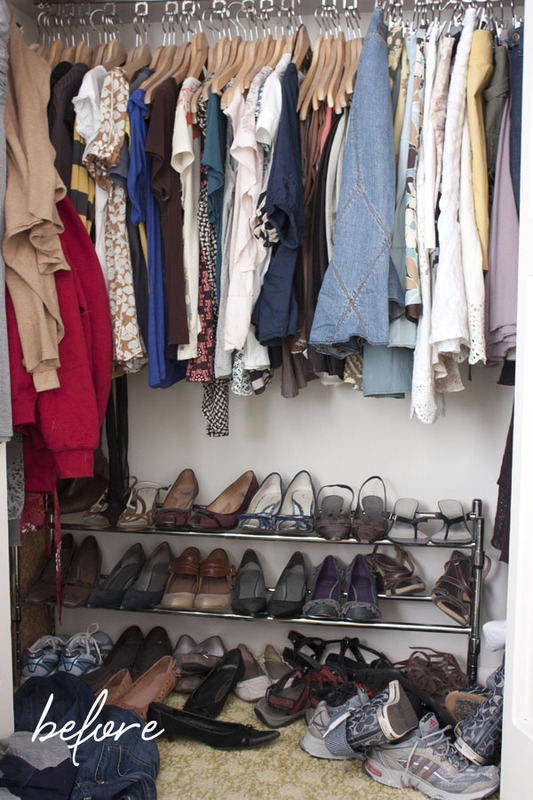 I kid, but as I was going through this process I did reveal a few gaps in my wardrobe and made a list of things that I can concentrate on looking for when I do have a rare moment to shop. 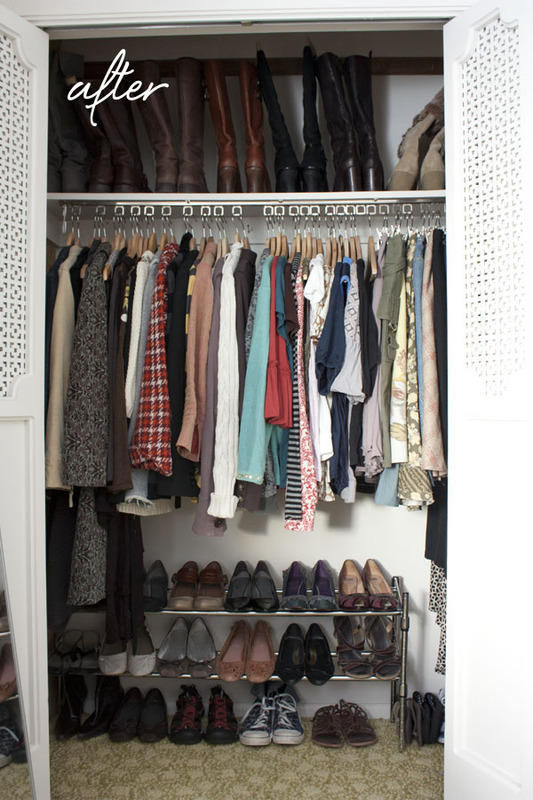 I have so many closets in my home that need this treatment that I am thinking of tackling a different closet every other week (in between my other Feng Shui challenges). If I do I will share it with you. 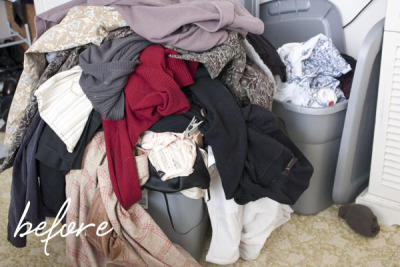 I hope you will take the Feng Shui challenge and clean out a closet of your own! If you do, leave me a comment below. I will be back next Friday with a new challenge!